Avoiding proabte, reducing taxes, providing for heirs, and protecting a family business. These are the more popular reasons that clients share with us when they start talking about why they want to establish an estate plan. Below we’ve described several of these issues. At the most basic level, we have found that clients want to protect and provide for loved ones, but sometimes they need a guarantee that a beneficiary will have “earned” his inheritance before any assets are disbursed. Wills and trusts can be structured to include incentives for achieving milestones. Parents and grandparents often use estate plans to reinforce certain values and promote success among heirs. For example, it’s not uncommon for a parent to require an adult child to graduate college with at least a certain grade point average before receiving any money outside of tuition and lodging. We’ve even seen parents require children to complete a personal finance and budgeting course before they can receive access to a full inheritance. An incentivetrust should clearly define a grantor’s objectives in the setting of goals that a beneficiary is being asked to achieve. Simply saying “must have good grades” or “must maintain a healthy lifestyle” is not definitive enough. One of the more sensitive issues that clients are reluctant to broach is having a beneficiary with a history of addiction. While it can be uncomfortable for some clients to talk about, we have found that a frank discussion is the first step to helping design a plan that protects a client’s entire family. A trust can set up guidelines for how to pay for an afflicted beneficiary’s living expenses (i.e., medical bills, rehabilitation costs, tuition, lodging and food), and it can also include incentives to reward positive steps toward recovery. These encouragements may come in the form of additional distributions being released if the child reaches or maintains certain benchmarks, such as holding a full-time job or attending counseling. You can help prevent this sort of thievery in your own family by making your estate plan more transparent. You should inventory your assets and personal belongings (i.e., family photos, jewelry, guns, artwork, collections, etc.) and send copies to your estate planning attorney, your executor, and your trustee. In addition, you should consider informing beneficiaries of what they are intended to receive and have each one sign a letter of understanding. To assist us in providing the best protections and service that our clients and their families deserve, we have found that it is important to ask our clients to list any risk factors or goals for their heirs? Think beyond the role of life insurance or the desire to avoid probate administration. What else is happening in your personal life that would be a motivation for structuring a strong estate plan? We hope this information was useful to you and helps you and your family. If you have any questions, don’t hesitate to call our office at 650-516-7002. You can also email me directly at mark@pacificaestatelaw.com. Over the years, I have received many questions from clients regarding their children and the individuals they choose to marry. Clients often worry about what happens if their children get divorced...will the ex-spouse be entitled to half of the child's inheritance, will that child have any asset protection available if the marriage goes sour? With proper estate planning, many of these concerns can be alleviated. Asset protection for children in bad marriages is possible with a thoughtfully-drafted trust. The most important reason to set up a trust is usually to avoid the time delay and reduce the legal fees of after-death probate proceedings. But the benefits don't stop there. If Dad and Mom are worried that their child is in a bad marriage and they don't want the future ex-wife or ex-husband to take half of the child's inheritance, they need a Living Trust that allows the child to retain the property in the trust without ever changing title of the asset into the child's name. When property is kept in Dad and Mom's trust, the child never takes outright ownership of the property while still being allowed to maintain control and access to the money. 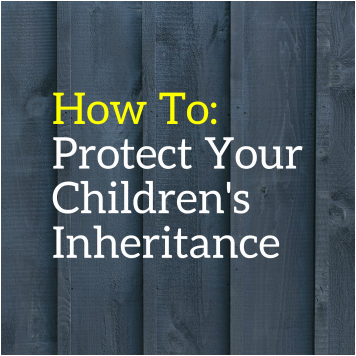 The child can receive income and, if necessary, access the principal, but if they get divorced, the child's inheritance can't be claimed by the ex-spouse. This ability to control the ownership and access to different types of property makes trust planning an invaluable tool for families that want to secure what has taken them a lifetime to earn. The ability to not only transfer wealth but do so in a manner that protects the assets for the next generation is an important strategy that most families should explore with a competent attorney. If you would like to learn more about the various options available to families, please don't hesitate to give our office a call. We've helped many clients with difficult family situations. A married couple, Harold and Wilma, have an estate worth $8 million. When Harold dies, he leaves everything to Wilma using the unlimited marital deduction which is used only by married couples to transfer any amount of assets free of the estate tax. However, two years later, when Wilma dies and leaves everything to their kids, every dollar in her estate over the $5.34 million exclusion amount will be taxed at 40%. If this lovely couple had used an A-B trust, upon Harold’s death, their assets would have been split into two trusts, a survivor’s trust (A trust) and a bypass trust (B trust). The bypass trust would have been funded with an amount equal to the exemption amount ($5.34 million) and the survivor’s trust would have been funded with the remaining assets. When Wilma dies, the bypass trust would pass along the $5.34 million to the kids free of estate taxes and the survivor’s trust would pass to the kids, also free of estate taxes. Wilma would have been able to use the money from both trusts during her lifetime so it is not the case that Wilma is giving up the $5.34 million in the bypass trust. Now however, with such a high estate tax exemption amount, it is fair to ask, why do an A-B trust anymore? Even though most families will not have more than $5.34 million in assets to pass on to their kids, the A-B trust model still has many practical uses. First of all, there is no way to tell what the estate tax exemption amount will be in a few years or in 10 years. A family’s assets may dramatically shift over time to bring them close to the exemption amount, which may be a lot lower in the future. Another reason to shelter assets in multiple trusts is to avoid relying on the portability of each spouse’s unused exemption amount. Portability is a new concept in estate planning and tax law, and estate planners are not clear about its permanence or impact down the line. A-B trusts also have non-tax related purposes. One good example comes up with mixed or blended families. A spouse may want to make sure that their children from a prior marriage are not going to be left out of the estate after he/she dies. With an A-B trust model, the bypass trust can be funded for the eventual distribution of those assets to the children of the prior marriage, without letting the surviving spouse use all of the assets to buy her new husband a Ferrari instead. There is also the opportunity to shelter assets from creditors using the A-B trust model. If the trusts are drafted appropriately, it can provide for some level of protection from creditors or even give the trustee of the trust the discretion to make the B trust a special needs trust so that the surviving spouse can qualify for public benefits such as nursing home care. Married couples should always consult a qualified estate planner when making big decisions about their estates. Tax laws change constantly and you’ll want to have someone there to help protect your wishes. There are a number of misconceptions about the costs that are associated with drafting and executing a revocable trust. Clients will sometimes think that transferring their house into the trust will cause a reassessment of property taxes or an imposition of the federal gift tax. Rest assured that no property reassessment takes place and no gift tax is levied. Property taxes are only reassessed when there is a "change in ownership" of the property. This occurs when you sell, devise or gift a piece of property to another for inadequate consideration, meaning they didn't pay you a fair price for the property. California law is clear and says that when an individual transfers property to a revocable trust, the state does not consider this to be a "change in ownership." California Revenue and Taxation Code Section 62(d)(2). If however you sell the property to another person, they will have to pay property taxes on the current fair market value of the property. So if you bought the house 30 years ago for $100,000, you only pay property taxes based on that amount, subject to the annual increase allowed under California law, even if you transfer the house into your revocable trust. Gift taxes work in the same way. If you transfer the house into your revocable trust, the government will not consider this to be a transfer of the property. A couple more notable fees include (1) recording fees which are levied by the county assessor. When executing a revocable trust, you must transfer title of the property into the name of the trust if you want the trust to work properly. A new deed must be prepared (I can do this for you) and recorded, but this only costs $15-20. (2) A documentary transfer tax is levied when selling property to another person. However, when transferring the property to a revocable trust, California law states that this transfer is exempt from the fee imposed by the documentary transfer tax because there is no consideration tendered. California Revenue and Taxation Code Section 11930. (3) Notary fee are also required when signing a revocable trust, but this fee is nominal. I hope that gives you an idea about the costs that are associated with a revocable trust. There is a huge benefit to transferring real property directly to children or grandchildren. In 1986, Proposition 58 became effective as a constitutional amendment in California. Its effect is to exclude from reassessment transfers of real property between parents and children. Why is Prop 58 important? In California, real property is reassessed at market value if it is sold or transferred. This means that if you bought your house for $100,000 in 1967, you're paying taxes on the property at a pretty low amount. But if you sell to a friend for $500,000 today, your friend will be paying higher property taxes because the property will be reassessed at the current value ($500,000). However, if you sell or transfer to a child, the child will get to keep the old assessed tax basis on the original $100,000 property value. This equals huge property tax savings. Proposition 193 passed in 1996 by California voters extends this exclusion to transfers between grandparents and grandchildren if the grandchild's parents (grandparent's children) are dead. Transfers of the primary residence (no value limit) and transfers of the first $1 million of real property other than the primary residences. The $1 million exclusion applies separately to each eligible transferor. Must the transfer be a gift? No, the transfer can be a sale, gift, or inheritance. Does a trust affect Prop 58/193 exclusion? No, the property that is transferred from a trust will be eligible for the exclusion. However, you are well-advised to seek out the services of an experienced estate planner (such as myself) because if your trust contains a "sprinkle/spray" provision and names a beneficiary who is not eligible for the exclusion, like a nephew, then the exclusion will not apply for any beneficiary even if the trustee only gives the assets to a child who would normally be eligible for the exclusion. If you have any questions about a transfer of real property to a child or relative, please feel free to call my office. Thanks for reading! There are many codes of ethics that apply to mental health practitioners and that require them to make business plans that safe guard their clients in the event of their death or disability. Here are a few to give you an idea of the language that is used and the responsibilities that may apply to you. The California Association of Marriage and Family Therapists Code of Ethics (Section 1.3): "Marriage and family therapists, therefore, maintain practices and procedures that assure undisrupted care. Such practices and procedures may include, but are not limited to, providing contact information and specified procedures in case of emergency, or therapist absence, conducting appropriate terminations, and providing for a professional will." The American Association of Marriage and Family Therapists Code of Ethics (Section 1.11): "Marriage and family therapists do not abandon or neglect clients in treatment without making reasonable arrangements for the continuation of such treatment." National Association of Social Workers Code of Ethics Rule 1.15: "Social workers should make reasonable efforts to ensure continuity of services in the event that services are interrupted by factors such as unavailability, relocation, illness, disability, or death." The American Psychological Association's Ethics Code (Section 10.09 and 3.12): "Psychologists make plans in advance to facilitate the appropriate transfer and to protect the confidentiality of records and data in the event of psychologists' withdrawal from positions or practice." California Business and Professions Code section 2919: "A licensed psychologist shall retain a patient's health service records for a minimum of seven years from the patient's discharge date. If the patient is a minor, the patient's health service records shall be retained for a minimum of seven years from the date the patient reaches 18 years of age." American Counseling Association Code of Ethics Rule C.2.h. : "When counselors leave a practice, they follow a prepared plan for transfer of clients and files. Counselors prepare and disseminate to an identified colleague or “records custodian” a plan for the transfer of clients and files in the case of their incapacitation, death, or termination of practice." The American Medical Association and the American Psychiatric Association's Ethics Code (Opinion 8.115 Section I, IV): "Physicians have an obligation to support continuity of care for their patients. While physicians have the option of withdrawing from a case, they cannot do so without giving notice to the patient, the relatives, or responsible friends sufficiently long in advance of withdrawal to permit another medical attendant to be secured." It's pretty safe to say that the confidentiality of client information is at the top of the list in terms of importance for most mental health practitioners. However, it's surprising to learn that many MFT's, psychiatrists, psychologists, and licensed social workers who handle individual clients in a private practice may not be very aware of the legal issues that would come up if they were to die or become disabled. Most of the time, without a proper business plan that takes into account the risk of death or disability, clients will likely learn about their therapist's health issues by showing up to an empty office when they arrive for their appointment. Clients will not have the opportunity to speak with someone knowledgeable about the situation who can help them cope with the sudden change in circumstances. Also, clients may not be able to receive their client files for some time and there would be a risk of losing their confidentiality if a family member of the therapist were to handle the client files. This scenario is not good! Therapists are required by their ethical standards to have some plan in place that protects their clients in the event of their disability or death. A great idea is to create a professional will. Think of a professional will as a set of instructions for another licensed practitioner to follow if this scenario presents itself. They would need to know your passwords for your website and client files and have keys for your office. They would need to know how to contact your clients and what to say to them. And it's also good to set aside some money for this person so that they will be compensated for their efforts. Leaving this whole process up to a family member in charge of your estate is a bad idea and runs afoul of your ethical responsibilities. I will be sure to list some resources that mental health practitioners can use to see if they are meeting their ethical requirements in a later blog post. Thanks for reading and feel free to call my office if you'd like more information. It is often difficult to notice when someone has become a victim of elder financial abuse. From personal experience, I can say that it is even difficult for attorneys to recognize that elder abuse has gone on in the context of what may seem like a basic contract dispute. Missing a cause of action for elder abuse can be devastating for a plaintiff suing another party who has wronged them. Speaking with an experienced elder law attorney is a good idea when you may suspect an instance of elder abuse. The laws prohibiting elder abuse are becoming very favorable for victims and the definition of elder abuse has expanded to include a great deal of behavior that is done for a "wrongful purpose" and is intended to harm or would likely harm an elder over 65 years of age. There are many types of behaviors that can qualify for elder abuse. One form that is particular to family members or close friends occurs when an individual gets an elderly person to sign a power of attorney that gives that individual the authority to head straight to the bank and take out money. When this happens and the individual uses the money for their own expenses rather than assisting the elder, elder abuse possibly has occurred. Another scenario could involve a family member who cares for an elder but then convinces the elder to put their name on the deed to house to avoid probate or some other legal hassle. Soon afterwards, that individual may take out a loan using the house as collateral and use the money for their own purposes leaving the elder at risk of foreclosure if the loan isn't repaid. An elder law attorney can help stop the bleeding in most cases of elder abuse. If a family member has taken advantage of an elder the law provide many remedies that can close-off that individual's access to the elder's money. The Elder Abuse and Dependent Adult Civil Protection Act (EADACPA) also provides for many remedies such as punitive damages and pain and suffering damages that could recoup the losses and make it attractive for an attorney to take on the case and help punish the wrongdoer. An essential element to a successful elder abuse claim is that SOMEONE MUST REPORT THE ABUSE. Because elder abuse often goes unreported, many individuals are being scammed out of their hard-earned money and the people they want to give the money to when they pass away are being left in the dust. Call an elder law attorney is you suspect your loved one has been the victim of elder abuse. An increasingly pervasive fraud being perpetrated on ordinary folks nowadays comes in the form of services offered by "Trust Mills." A trust mill is a business that markets and offers estate planning documents to elderly individuals. They usually associate with a lawyer who legitimizes the operation, but who fails to uphold the ethical requirements that are put on lawyers by the professional rules of conduct...and common decency. A trust mill employee will typically send out a mailer offering estate planning services. When you respond, a non-lawyer will solicit the estate planning products they provide and once you agree to pay for them, you will speak to a lawyer who quickly goes over some of your basic information. The lawyer will prepare a trust and even try to sell additional products such as insurance annuities that elderly people don't need. A huge ethical conflict arises when a lawyer, who is supposed to have your best interest in mind, tries to sell you financial annuities. Often times the annuity is grossly unfair and contains restrictions that limit your ability to opt out of it. The trust is usually a basic document that in no way is tailored to the needs of the client. This type of trust puts your assets at risk. When a trust is not specifically tailored to each client, your wishes as to the distribution of your assets may be compromised and your estate may be hit with unnecessary tax burdens that could have been avoided. If you purchased your estate planning documents from a trust mill, you should immediately seek out the services of an experienced estate planning attorney who can review your documents and make sure that they are sufficient. In most cases, changes need to be made in order to ensure that you have an effective estate plan in place. If you were sold an annuity that was not in your best interest, a lawyer may be able to help get your money back. 1. You never spoke with a lawyer directly, and if you did, the lawyer spoke with you only briefly over the phone. 2. The lawyer or trust mill employee tried to sell additional financial products such as an annuity or insurance policy. 3. The documents that were prepared for you seem generic and not tailored to your situation. 4. There are inconsistencies in the documents. 5. The lawyer may have some misconduct issues listed on the California State Bar website...just look up his/her bar #. If you noticed any of these signs when your purchased your estate planning documents, consult with an experienced attorney soon to avoid the unnecessary expense and hassle that comes with failed estate plans. Often times, a reputable attorney will charge less for their services than trust mils, not only because we don't sell things you don't need, but because we charge our clients fairly for work. Mark has an interest in writing about developments in the field of estate planning and sharing his thoughts on related topics.